It would be a mistake to identify Pope Francis with a stripped-down, secularized style of worship – and a still-greater mistake, to see Christian humility and liturgical beauty as opposites rather than harmonious counterparts. Since the election of Pope Francis, “humility” has become a watchword in the life of the Church. This seems, on balance, to be a good development: a reminder, for both the faithful and the public at large, of a virtue that has been described as the wellspring of all virtues. Humility is a quality notably lacking, too, in our uncivil and technologically-prideful age. If Pope Francis can teach some measure of true humility to a polarized Church, and a dangerously embattled world, he will have accomplished a great thing. Granted, there is a danger of exaggerating the Pope’s actual virtues, and fostering a misguided cult-of-personality. Yet this is the risk one always takes when he allows the light of Christ within him to “shine before men, that they may see your good works and give glory to your Father who is in heaven” (Matt. 5:16). “Poverty,” too, is a watchword of the current pontificate. Shortly after his election, Francis spoke of his desire for “a Church that is poor and for the poor.” He has acted on this desire in several meetings with the marginalized, and actions on their behalf; and the same motive shows in his somewhat stripped-down lifestyle and appearance. It is beyond reasonable doubt that Benedict XVI was – and is – a profoundly humble man, with a deep concern for the poor. Still, no two Bishops of Rome are quite alike; and it is clear that Pope Francis’ personality and pastoral style have allowed him to manifest these same qualities in ways his predecessor would not have attempted. While acknowledging the differences, however, one must be careful not to overstate them. In particular, we must remember certain things that the secular press easily forgets: first, that humility and simplicity did not come to the Church – or even the Papacy – with Francis; and secondly, that his shift in style and emphasis is not an attack on Catholic tradition. Despite the barely-concealed hopes of some commentators, that is not on the pontiff’s agenda. As Francis himself reaffirmed at a key moment, the Pope’s task is that of “putting aside every personal whim,” so as to guarantee “the obedience and the conformity of the Church to the will of God, to the Gospel of Christ, and to the Tradition of the Church.” While he may place greater emphasis on the outward signs of humility and simplicity, there is no solid basis for casting Pope Francis as the anti-Benedict, bent on overturning tradition in the name of these values. With that said, however, there are – sad to say – elements in the Church that would probably not hesitate to attack sacred tradition, while placing themselves under the banner of “humility” and “poverty” and claiming the supposed patronage of Pope Francis for such efforts. This danger exists on several fronts, but it is perhaps especially acute in matters pertaining to the Sacred Liturgy. It is not difficult to imagine the flag of “humility” being taken up by proponents of a drastically stripped-down visual and liturgical style, on the assumption that Christian humility – the ethos of “a Church that is poor and for the poor” – cannot coexist with classical beauty and aesthetic grandeur. “Francis-like humility” would then become a new, though ill-founded, justification for the liturgical iconoclasm that plagued the Western Church after Vatican II. Literally speaking, iconoclasm is the “destruction of images,” especially sacred religious images. In the Byzantine Church – from whose perspective we write, as Eastern Catholic monks – iconoclasm was a major heresy, resolved only by an ecumenical council. In a broader sense, however, “iconoclasm” may refer to the defacement or lowering of anything that symbolizes the sacred. In this sense, there is an iconoclastic tendency in every liturgical approach that would strip away poetry, mystery, and outward beauty from Christian worship, in the name of a supposedly more “humble” and “simple” style. 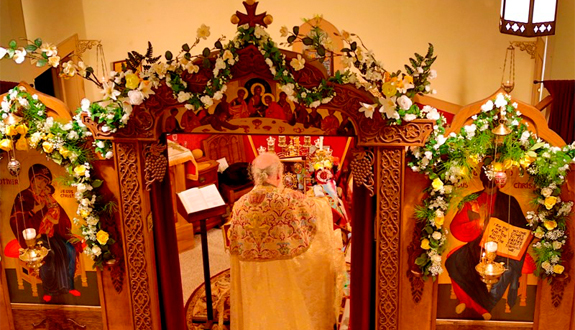 Granted, some liturgical traditions are more elaborate than others; and the ways of worship will differ, even within one rite, due to culture and circumstances (as is the case in our Byzantine tradition). But it is always dangerous, and arguably wrong in principle, to secularize the liturgy: to make it look, sound, and feel like a merely worldly event – through popular music, de-sacralized art, and dumbed-down language – on the assumption that these changes reflect the “humility” of Christ or the “simplicity” of his Gospel. In practice, the frequent result is not humble simplicity, but iconoclasm – a defacement of the sacred. While his interest in the liturgy is much less pronounced than Benedict XVI’s, Pope Francis is hardly the partisan of a “low-church” worship style. His appreciation for our Byzantine rite – with its lengthy, complex chanted services – is well-known, dating from his days as a seminarian. The Pope spoke of liturgical beauty as a way of evangelizing, in Evangelii Gaudium (no. 24); and in a recent meeting with priests, he talked about “recovering the allure of beauty” in Catholic worship, so that it may elicit “the wonder both of the person celebrating and the people.” Moreover, while he has criticized certain attitudes and ideological postures sometimes associated with Catholic “traditionalism,” the Pope has shown his support for the Extraordinary Form of the Roman rite – the traditional Latin Mass – on several occasions. Whatever his personal proclivities may be, it is clear that the Pope sees no conflict between a lifestyle of humility, simplicity, and poverty on the one hand; and a way of worship that reflects the majesty of God and the solemnity of the Christian mysteries, on the other. Thus, it would be a mistake to identify Pope Francis with the stripped-down, secularized style of worship that has caused so much trouble in the post-conciliar era. But it would be an even greater mistake, to assume that this style of worship is somehow necessitated by the values of Christian poverty and humility that the Pope has come to represent. It is to that greater error, that we now turn our attention. Poor Church, Yes – Iconoclastic Church, No! While it has lost much of its momentum since the heyday of the 1970s and 1980s, the iconoclastic approach to liturgy and religious art has not gone away: indeed, it remains deeply ingrained, at the parish level, in much of the Western world. Today, there is a danger that this de-sacralizing attitude will be revived – and Benedict XVI’s efforts toward authentic liturgical renewal rolled back – by a misreading of Pope Francis’ words and ideals: an interpretation that casts Christian humility and liturgical beauty as opposites in tension, or even outright contradiction, rather than as potentially harmonious counterparts. Notably, this assertion would have been repugnant to Pope Francis’ namesake St. Francis of Assisi – who wrote in his Testament that he wanted “above all” for Christ’s Eucharistic presence “to be honored and venerated and reserved in places which are richly ornamented.” This is in keeping with the saint’s entire view of nature and creation as showing forth the glory of God: for Il Poverello, there is no question of demonstrating our own humility through minimalistic worship. Rather, we show our ultimate poverty before God precisely by offering all created beauty – symbolically present in the Christian temple – back to its Creator. An iconoclastic idea of Christian humility would also be foreign to the various Eastern Christian traditions (such as the Copts, Armenians, Syriac Christians, and others in addition to our own Byzantine lineage) – which have preserved their liturgical and artistic customs, even during periods of brutal persecution which often left them tangibly impoverished. Nor is this preservation simply a nostalgic effort to evoke or cling to history: for instance, the seemingly “imperial” worship style found in our Byzantine tradition is not a mere relic of outdated theological-political triumphalism. On the contrary, it reflects and teaches deep truths about the Kingship of Christ, the meaning of creation, and the divine destiny of man. Examples could be marshaled and multiplied, to show that Christian humility and poverty do not require the abandonment of classical beauty and traditional liturgical forms. And such examples would by no means be confined to history. Across the globe even today, many of the world’s humblest and poorest Christian populations – those of the Middle East, or India, for instance – are among those most intent on maintaining their long-established forms of liturgy, art, and architecture, in all their outward splendor. Ironically, far from expressing a sense of global or social solidarity, the insistence on a minimalistic and exaggeratedly “humble” religious aesthetic actually seems to be a form of modern Western parochialism among an educated elite. The movement toward a contrived informality and secularity in liturgy and art did not come from the poor or the ordinary faithful, but from a class of trained professionals who saw themselves as the most qualified readers of the signs of the times. Their basic aspiration – to engage and evangelize the modern world more effectively – was good, and remains essential. Yet the result of their iconoclastic experiments can be seen in the “devastated vineyard” of closed seminaries, barren sanctuaries, and dwindling religious orders. The Western Church has already tried the reductive, desacralizing approach to humility and poverty, which claims that the Church must put off her outward signs of holiness and simply meet modern man on his own terms – and garb – in the secular city. Whatever its intentions may have been, this project has proved to be a dismal failure. That being said, however, it is also beyond doubt – and to some extent, understandable – that certain “high” liturgical forms have taken on a problematic connotation in the minds of some people. When these individuals encounter ornate vestments, sacred chant or polyphony, elevated language, and traditional liturgical gestures and postures, their minds are not (in the words of the Council of Trent) “excited, by those visible signs of religion and piety, to the contemplation of those most sublime things which are hidden” in the Church’s worship. Instead, for these people – somewhat tragically – these outward signs of God’s presence have instead become symbols of other things: clerical arrogance and ambition, reactionary politics, cultural nostalgia, and a posture of chauvinistic triumphalism (instead of humility and charity) toward the non-Catholic world. So their response to these liturgical forms is, reflexively, quite negative. On the individual level, these associations may be rational or irrational, grounded or baseless. Either way, they are a part of the Church’s human reality, and an undeniable influence on the liturgical problems of the modern West. Many of the post-conciliar “liturgical iconoclasts” believed – wrongly, but quite sincerely – that they were exorcizing a spirit of arrogance and opulence from the life of the Church, by stripping away beauty and tradition from the sanctuary. And this misunderstanding was not necessarily a culpable one: in truth, certain sub-Christian attitudes had become intertwined, at least socially, with the forms of Catholic piety and public worship over the centuries. The impulse to “start from scratch” was wrong, but understandable. All of this raises the question of how to harmonize humility and poverty (in its various Christian senses) with beauty and tradition, in the life of the Church. And while there is no simple or all-encompassing answer to the question, we are convinced that the Eastern Churches can make an important contribution to this goal – offering a concrete example of how sacred tradition can be maintained, especially in the Church’s liturgical worship, even in a “Church of the poor” that subsists in humble circumstances. It would be wrong, of course, for Eastern Catholics – of the Byzantine rite, or any other non-Western tradition within Catholicism – to hold themselves up before others as models of humility, or even poverty: for our history, like that of any group within the Church, is far from perfect. No one is naturally immune to the temptations of pride or prestige, and the history of the Byzantine Empire is hardly a pristine record of Christian discipleship. For Byzantine Christianity, the lessons of humility and poverty have been learned largely on the historical road of suffering and marginalization, long after the glory-days of Constantinople. And the same is true for the various non-Byzantine traditions of the Christian East – whose adherents have suffered terribly for long portions of their history, particularly after the rise of Islam. Yet in the course of such trials, the Christians of the different apostolic Eastern traditions have been confirmed in the practice of their ancient ways. Even among the immigrant communities of the so-called “diaspora” (in North America and elsewhere), they almost never try to secularize – or artificially modernize – the look, sound, and feel of their churches and liturgies. Services are not shortened for a modern attention span, or updated in a faddish quest for relevance. Ancient forms of sacred music are learned and loved by the people, not rejected in favor of a prefabricated songbook. At the same time, this kind of authenticity among Eastern Christians usually has little to do with any kind of self-conscious and ideologically-charged “traditionalism.” More often, it is a case of people simply having a sense of where they come from, who they are, and what they wish to pass on to posterity. They live out their received tradition, typically not in a clenched opposition to prevailing trends in the world or the Church, but almost as a matter of course. Among the Eastern Churches, too, one finds what can only appear as a great irony to many modern Westerners: the poorer and more marginal these ancient Christian populations are, the more willing they often are to invest in the building and maintenance of beautiful churches. Naturally, one must not idealize the Eastern Churches – which suffer from many of the same problems that plague modern Western Christianity, along with certain issues that are somewhat unique to us. Among some Eastern Christians (both Catholic and Orthodox) one may find attitudes of ethno-national chauvinism, nominal religiosity, or self-satisfied pride in what distinguishes “us” from “them” – just as one finds in most samples of religious adherents. No group of Christians – or people in general – is exempt from the challenges of modernity; and we are all susceptible to the “spiritual worldliness” that Pope Francis (following Henri de Lubac) has named as the Church’s worst temptation. Even so: if one wants to see how beauty and tradition can be joined with a spirit of penitential humility and (sometimes quite tangible) poverty, one could certainly begin his search among the various apostolic Eastern churches, including those in full communion with Rome. Despite our human failings, we offer a possible model for the Western Church to learn from, as it works to restore the rightful splendor of worship while avoiding the spirit of worldly self-admiration – which has, at times, plagued all traditions. But we do not mean, in any way, to imply that one must look outside of Western Christianity to find ritual solemnity combined with an ethos of Gospel simplicity. For instance, in many of the Western religious orders – and especially in authentic, traditional Benedictine monasticism and its derivatives – one finds the same convergence. Likewise, there is St. Francis’ aforementioned praise of “richly ornamented” churches, for the sake of honoring Christ. No liturgical form can ever guarantee, or automatically produce, the “poverty of spirit” that inherits the Kingdom and the “purity of heart” that sees God. It would be a mistake to focus too narrowly on the Church’s liturgical worship, to the neglect of other essentials. Still, we are physical and sensory creatures, not beings of pure spirit; and the way we live in God’s world is bound to be conditioned by the way in which we worship the Lord together. We are also participants in history, who cannot – by the very structure of our human existence – ultimately avoid some form of tradition in our lives. Archimandrite Nicholas Zachariadis is the founding abbot of Holy Resurrection Monastery, an Eastern Catholic monastery in Saint Nazianz, Wisconsin.